Well, I caved yesterday and finally got a pinterest account. As an avid tumblr user, I was a little bit skeptic about pinterest but now after getting an account, I realized that the two are actually a lot different and now I have been pinning constantly! There is so much inspiration for summer that I have become a bit overwhelmed. 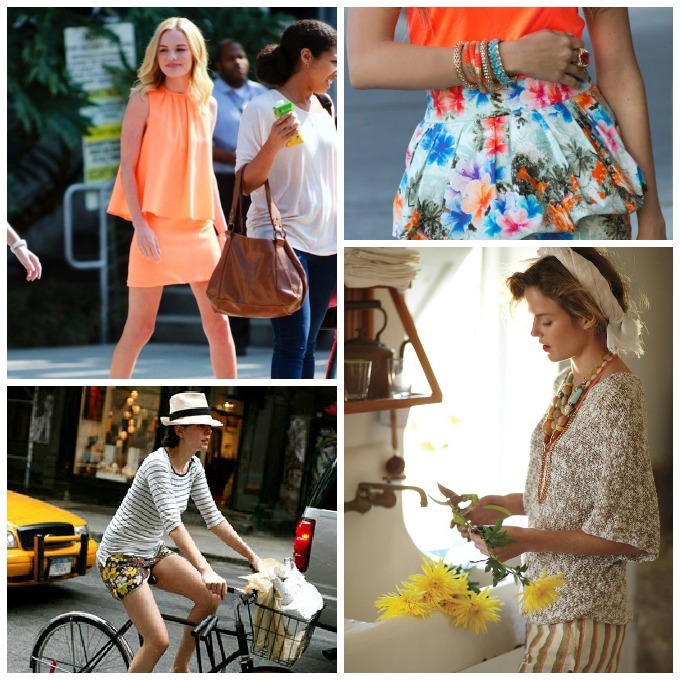 Whites, bright colors, structured but lady like pieces and vintage pieces have all been inspiring me this summer. What's inspiring you? Speaking of summer, I can't believe it is already June 1st and the official start to summer is only a few weeks away! I have a few summer goals that I really want to accomplish. 1. Raystown Lake for a weekend with my family or friends. 2. A big bonfire complete with an assortment of summery baked goods and drinks. 3. Hiking at Pinchot Park, complete with a picnic of course. 11. Visit my friend Meaghen in New York. 13. Buy all of the things I need for my new house in Philly and fleamarkets and thrift stores. Haha yeah, Pinterest is one of my favorite things in the world:) It's so inspiring, but Tumblr is still pretty awesome too. I hope you have an awesome summer! These are all such great summer goals! Maybe I'll make a summer goal list too and reveal it on the first official day of summer! Your choices seem so interesting! I hope you'll achieve your summer goals! I won't cave I refuse haha! What GORGEOUS pics!!!! Beutifull pictures! i love that style, fallowing you! I'm a fellow tumblr user and you say it's different, huh? Interesting. I still don't think I'm ready to get one lol. I'd be hopelessly addicted! That last one on the left is so stunning. I love bright colorful dresses, eeee~! beautiful post!!! i'm following your blog!!! Lovely photos and a lot to follow! Thank u so much for visiting my blog n ur sweet comment !Would really appreciate if we follow each other via GFC&Bloglovin or maybe both! Do let me know! I love your summer list - I should probably make one too! Love your space here, Chelsea Elizabeth. I'll be following you on Pinterest! I love the summer inspiration books and goals! I want to go on more bike rides myself, as it's so nice to be outdoors!! i love all the bright colors for summer. pinterest seriously provides the best inspiration to try new things, i love it! I love the little snippets you've shared here! They are so pretty!! I was a little skeptic of pinterest too loving tumblr but pinterest is great! I think its like a little dictionary. Lots of things in one places.